Good Choice Reading: Meet Our New Guest Reviewer! 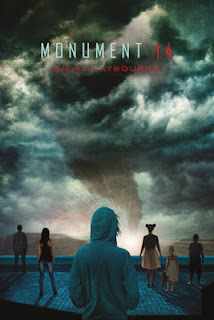 + Review of Monument 14 by Emmy Laybourne! Meet Our New Guest Reviewer! + Review of Monument 14 by Emmy Laybourne! GCRMaria here -- and I would like you all to give a warm welcome to May Ling -- our new, fabulous, incredible, and wonderful guest reviewer! Fourteen kids. One superstore. A million things that can go wrong. In Emmy Labourne’s action-packed debut novel, six high school kids (some popular, some not), two eighth-graders (one a tech genius), and six little kids trapped together in a chain superstore build a refuge for themselves inside. While outside, a series of escalating disasters, beginning with a monster hailstorm and ending with a chemical weapons spill, seems to be tearing the world - as they know it - apart. It was the plot of this storyline that first drew me in to read this book. I will be the first to admit that I love a good post apocalyptic story, whether it’s a book, movie or TV series. (Who else is waiting “patiently” for the return of The Walking Dead?) But this whole idea of the world being taken over by a hoard of the undead because there’s an evil scientist somewhere is a little overdone, to say the least. I appreciate that this story is not only about a natural disaster and the chaos that ensues, but also that the main characters are all school aged. Their being sequestered to a superstore and having to figure out things for themselves is almost a quiet homage to Lord of the Flies. I was a little put off at first that the story dove right into pandemonium in the first chapter with little character development. I didn’t get much of a backstory or a way to understand the characters right off. However, Laybourne was able to slowly give us insight to their characters and personalities through their actions during the various “surprises” that laid in store for them. If that wasn't enough, it's interesting to see how each of these personalities will interact with each other (especially when most of them have NEVER spoken before), if they will break the mold of their stereotypes and most importantly, who will surprise you the most in the end. I love this idea that, as a reader, you develop an opinion of a character and then BAM, not what it seems. I would recommend reading Monument 14, and keep an eye out for it’s sequel Monument 14 Sky on Fire.